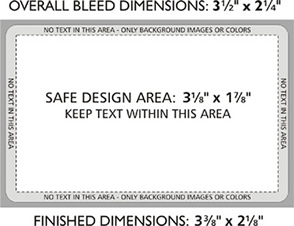 For graphic designers, it is important that you deliver finalartwork in a print ready status to your client. There are several important points for your attention. I am eason, have worked in the artwork department of a card printing factory for a couple of years. So i know a little bit about the print ready artwork process. So i come here to shear my experience with your guys, especially for the freshmen in this field. I am not a native english speaker, so it must be a lot mistakes in my writing. Please understand. Thanks. Ok, let start now. 1. Software, file format: Most plastic card manufacture use coreldraw and illustrator. They accept various file format like: .cdr, .ai,. eps,.tif...etc. Personally i recommend cdr or ai version. Many people export file in pdf, but for some special effect in the artwork, it may affected after plasticcardonline printer import artwork into their software. So it is best that you can supply a very "original" artwork. 2. Vector or bitmap: This is always a very tuff thing for plasticcardonline printers. Many clients supply low resolution photos (Below 300dpi), usually it looks blur in monitor, these files is not good for full colour plasticcard printing. According to my experience, if the photo is small sized one, resolution is not a big problem, some times 72dpi also works. As client like get photo from internet, these photos are always low res at bout 72dpi. If shrink the size to 25% the resolution will be enough. When you design an artwork it is ok to keep photos as bitmap, but make sure the rest text and colored blocks/shapes/linearts are vector. It for the best result for printing, vector artwork can make the printed shapes very sharp and clear. And another thing you need pay attention is if client supply logo as a low resolution jpg file. You have to recreate it , make it vector. No body want their logo unreadable. 3. CMYK,RGB, Spot color: For printing CMYK is the most popular setting. RGB is for web, never use it. And some clients need accurate color, so you have to use spot color for pantone match. 4. Text and font: As i mentioned above. Text must be vector to make sure the best result for printing. You must pay attention when you exporting finalartwork, all fonts must be converted into outlines. Or you must supply used font with artwork. Otherwise, when the plasticcardonline printer open your artwork, the font will change. That is very dangerous. Not only the font, as it changes, the layout may also be affected. So this is quite important and always ignored by some designers. And for some artwork, even it is confirmed currently, you or your client may change the text contact in the near future. For this consideration, do not outline the text, store the font file with artwork. This can save a lot of time. Other wise you may never know what font is. 5. Bleed!Bleed!Bleed! This is the most common mistake for new designers, artwork for plastic card must be NO LESS THAN 3mm. The bleed area must be consolidate with the main artwork , this area will me cut off. When factory do cutting, they can not always cut very accurate. So make sure text, logo never too close to the edge of the card. The following size spec may helps. And if you need vector coreldraw template file, you can download here. 6. Corpmark, cutline: Make sure finalartwork has corp mark shown on artwork, it helps your plasticcard manufacturer locate the cutlines. 7. Signature stirp, mag strip, embossing, sequential number: When you do design, if it has embossing like membership cards. Pay attention to the back, so that embossing area will not affect the signature on the back if it has one. Same are the texts. Embossing text font name is OCR. Thermal printed sequential number is black only. So need pay attention to the background color. If it is too dark, add a white square. Embossing can be gold, silver,black tipped. 8. Silver foil, UV: If you want add silver foil/UV to the plasticcard. Make a separate layer with corp mark. Solid black, so the plasticcardonline printer can locate it correctly. That all i have recently , i will keep updating this guide hope it is helpful with the new guys. Any body who want to give me suggestions or need help , please email me: artwork at plasticcardonline dot com. Really nice and detailed info there. Can I just ask one thing though, why are the card dimensions in Inches?! That's a bit old school. Thats the states for you... When the world went metric, they forgot about america.